Ed Berliner is not one to shy away from an opinion, even if it goes against the thought patterns of main-stream media. In this guest column that originally appeared in the Atlanta Examiner and is republished here with Mr. Berliner's permission, he looks at all the statements and behaviors that have been attributed to Rush Limbaugh, and if there is a double standard being exercised when it come to Limbaugh and the way Keith Olbermann is treated by the same organization. Disclaimer: The opinions, beliefs and viewpoints expressed by the various authors and forum participants on this web site do not necessarily reflect the opinions, beliefs and viewpoints of the Eye on Sports Media, The Cayuga Group, LLC, and.or its employees and others who write for Eye on Sports Media. The truth is out there. All you have to do is ask the right questions. (Q) Can anyone prove that Rush Limbaugh actually said “slavery built the South” and that the “streets were safer after dark” because of it? (A) No. This is the “quote” that became the lynchpin of every mass media feeding frenzy and the standard line of introduction to the story. However, all of the pseudo-journalists, pundits and media narcissists failed to use the first rule of covering any story. Check the facts. And when it comes to source material, have at least two credible sources to verify the story. There is no substantive proof Limbaugh ever made this statement or anything like it. No one has been able to cite audio, video, print or tarot card it came from. (Q) Has Limbaugh made statements in the past that could be construed as racist, bigoted, and/or hateful? (A) Yes. The key word here is “construed”. Those who check facts cannot cite an instance where Limbaugh said he hates people of any race, creed or color. But words are dangerous things, and how they are used and in what context can relay any number of emotions and intents. One of the more slipshod manners of reporting the news is to use material, whether it’s audio, video, photo or print, out of context. President Barack Obama has certainly learned this first hand when reading some of the words being attributed to him. Here’s where we run into the next issue of fact versus hyperbole. Limbaugh has been quoted by news reporters and news organizations with the following: “In President Obama’s America, white children get beaten up on school buses by blacks.” However, when one checks the tape of that specific show, this is not what Limbaugh said. He was, in fact, employing license of his own in commenting about the “Newsweek” cover dated September 14th, where a white baby was on the cover with the words “Is Your Baby Racist?” Limbaugh did indeed fan the racial flames during his show by pitting black against white on the political landscape, which was certainly a pointed use of race in making an argument. As with any broadcast or written pundit of any political affiliation, Limbaugh often is viewed as insulting. But as the non-partisan Media Research Center has revealed, quite often Limbaugh’s comments are taken completely out of context. 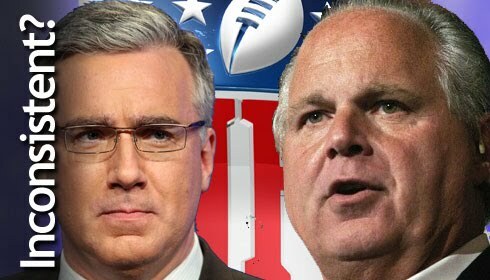 (Q) Are African-American NFL players as enraged by Limbaugh’s comments as we are led to believe? (A) Not in any affirmable numbers. NY Giants DE Mathias Kiwanuka and NY Jets LB Bart Scott both said they would never play for any team owned by Limbaugh. But as of this writing, there has been no loud cry from a great number of players. The biggest objection has come from NFL Players Association Chief DeMaurice Smith. Does this mean no other black player objects to the idea of Limbaugh as an owner? No definitive answer can be made because we simply have to go with the facts. The facts show few players actually speaking out. And when have you known professional athletes to not comment when they truly believe they are right, or that it will get them more publicity? Fair to opine that the NFL may be quietly gagging the players on this issue, but that would be a monstrous mistake if it is true. Again, we divert to hyperbole for the purpose of garnering attention. Al Sharpton recently stated that Limbaugh owning a team would become a major hurdle in the upcoming talks for a new collective bargaining agreement between the NFL and the Players Union. There are no facts to support that argument whatsoever and it is nothing more than unsubstantiated guessing. From one who has covered the NFL for over 20 years and reported on more than a few contract hassles, I am confident in speaking from experience that players and owners care about money first, money second, money third, followed by a plethora of other items all connected to money. This is opinion, but unlike Sharpton, based on personal and first hand knowledge in history of such negotiations. Never have inflammatory statements made by a prospective/current owner, or even a Head Coach, been mentioned as a key point of bargaining. (Q) Is there a something of a double standard being presented by the NFL when it comes to moral standards? (A) A case can certainly be made. The NFL, citing the concept that everyone deserves a second chance, has allowed a convicted animal killer and felon to resume his career. They have in the past allowed a player who killed a woman while driving drunk to continue playing. There are numerous instances of deadbeat athlete fathers neglecting to care for children born in and out of wedlock. Assaults on girlfriends and wives are too numerous to count. Collective heads are often in the sand when it comes to players carrying illegal firearms, though the Plaxico Burress case was too high profile for them to let slide. A case could be made by some that the NFL has far greater problems than dealing with a minority owner who makes controversial and inflammatory remarks. And while there is no doubt some of Limbaugh’s words, whether said in seriousness or jest, can and should be deemed hateful and damaging, here’s the rub. The NFL is very concerned about being connected to someone who makes such disparaging and hateful comments, for fear it may reflect on the NFL in general. Keith Olbermann is a co-host for NBC’s Sunday night football pre and halftime shows while also being a liberal commentator for MSNBC. He has, in recent months, referred to one of his competitors as a “racist clown”. Called another competitor a “mashed up bag of meat with lipstick”. Referred to Limbaugh’s assertion that he helped spawn other talk hosts “like congratulating yourself for spreading syphilis”. Has ridiculed a two-time Congresswoman noting her son was undergoing “reeducation”. Used a Downs Syndrome child to mock a specific opinion on health care reform. Engaged in trash talk about a woman for expressing her views on marriage by calling her “stupid”, “partially made of plastic”, and comparing her to a Nazi killer. (Q) When it comes to being associated with the NFL, is one form of hate speech acceptable while another is not? Ed Berliner has covered sports on national and regional cable, television and radio for over a quarter century. A 2-time Emmy Award winner for reporting and commentary, Ed has also performed play-by-play duties for MLB, NFL, NCAA, PGA, NASCAR, Boxing and many other sports. His exclusive interviews with athletes & commentators from every walk of sports can be heard at “Stone Cold Sports". Contact Ed.